» Why Are Rebounders So Expensive? How Much Do They Cost? If you’re into fitness like we are, chances are you got scared after seeing how expensive rebounders can be. 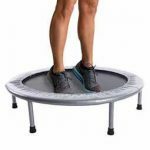 So, how much does a rebounder trampoline cost? They can be very expensive, but their price is usually linked to their quality. Prices can vary from around $50 to $1000. It depends on the manufacturer and the quality of the rebounder. Do I Need an Expensive Rebounder? How Much does a Rebounder Cost? How Much Is A Bellicon Rebounder? 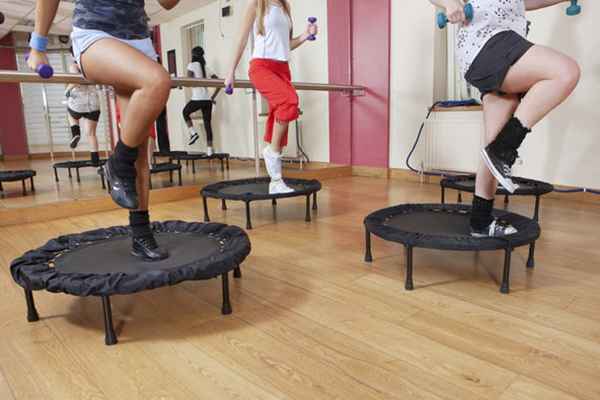 Many scientific studies have shown that rebounding has very positive effects on health. It’s a highly intensive cardio workout. It helps with weight loss, circulation, muscle tone and strengthens the whole body. We achieve these effects by jumping up and down repeatedly. Basically, exposing our bodies to sudden acceleration and deceleration. If you’re into fitness and rebounding as a form of exercise, then the answer is probably yes. How much does a high-end rebounder trampoline cost? Well, a lot. Although, if you look at it as a long-term investment, they are probably worth it. They’re built from high-quality materials and are meant to last a long time. Furthermore, the companies that make high-end rebounders take pride in their skills. Making a balanced and safe trampoline is not easy. It all matters: the fabric of the mat, the elasticity of the springs, the metal used for the trampoline body, etc. You can imagine that a lot of time and effort went into designing these modern exercise machines. Studying the health effects of rebounding and developing technologies costs time and money. So, their price goes up. The cost of a rebounder trampoline varies from $50 to $1000. It depends on what you’re looking for. So, you can get cheap rebounders for about $50 at a local store. However, they are almost always intended for kids. Cheap rebounders are made out of low-quality materials and generally don’t last long at all. People who buy cheap rebounders often end up complaining about losing their investment. On the other hand, you can get expensive rebounders that cost around $500 and even go up to $1000. The more expensive rebounders can last for years to come, even with daily usage. You can imagine how jumping on something every day can break anything. Urban Rebounder, Needak, ReboundAIR, Cellercise/Cellerciser, and Bellicon. Urban Rebounder - a company from China that holds around 30% of the rebounder market. Most of their fame comes from their cheap rebounders, averaging around $90. In contrast, low-quality rebounders earn mixed customer reviews. Read our Urban Rebounder review here. Needak - a company based in the USA that takes pride in their high-quality rebounders. Their prices vary from around $250 to $350, depending on the type of rebounder. Needak holds almost 40% of the market. They receive a lot of positive reviews from customers. ReboundAIR - a company based in Taiwan and founded by Al Carter, one of the leading experts in rebounding. ReboundAIR patented a unique quarter-fold rebounder in 2006. With an estimated 15% of market share, their prices range from $350 to $500. Cellerciser - also based in Taiwan and sponsored by David Hall, an expert on rebounding and fitness. Their most expensive packages include online group coaching with David. Their rebounder prices range from $400 to $900. Read our Cellerciser rebounder review here. And last but not least: Bellicon. Out of all the popular rebounder makers, Bellicon takes the most expensive cake. Bellicon is a company from Germany that takes pride in their rebounder design because of their engineering skills and the unique bungee cord suspension system. They were the first to hit the market with this heavy-duty piece of exercise equipment. Bellicon rebounder trampolines cost anywhere from $500 to $1000, depending on the model. Their bungee suspension system gives you the feeling of jumping on clouds. This system makes working out easier. It helps relieve the pressure on your knees and ankles during exercise. It also helps a lot with noise reduction, making it even more appealing to customers. Bellicon receives a constant stream of praise in customer reviews, despite having a market share of about 5-10%. Now we will take a short look at their most expensive, elite rebounder: Bellicon Premium. The Bellicon Premium rebounder is just a bit shy of a full $1000 price tag. That effectively makes it the most expensive mini rebounder trampoline out there. It consists of an industrial steel frame, an ultra-durable and UV resistant mat, as well as ultra elastic and durable bungee cords. 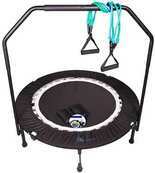 So, rebounders are expensive because a lot of research went into them. Creating the most optimized bounce and a durable platform isn’t easy. However, such a big price tag will always seem a bit fishy. In any case, we believe it pays off in the end. Finally, most companies also offer you a chance to customize your product. They offer adding support bars, foldable legs, custom mat colors, etc. The price tag goes up with upgrades. Rebounder prices go from around $50 to $1000, and each brand offers something unique. Do you think quality justifies the rebounder trampoline cost? Leave your thoughts and questions in the comments. Also, if you thought this article was interesting, please consider sharing it!